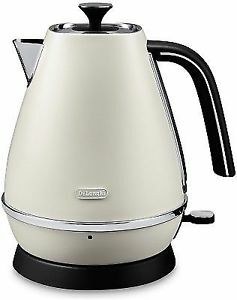 This kettle makes a realy statement with unique Italian design the Distinta Jug Kettle from De'Longhi is second to none. With its sophisticated matte metallic finish and chrome details, 3kW concealed element and a generous 1.7L capacity, it guarantees a quick boil and easy to use. This is the perfect choice for a busy kitchen with a useful design featuring a detachable base for cord-free convenience, water level indicator and a swivel base.